Paper has been cut, ribbons have been trimmed, things have been printed, stickers have been stuck, and envelopes have been sealed. Names have been checked off lists. Stamps have been stamped. The invitations are heading out the door! Get ready! We have two technology topics to discuss, so get your pointy hats on. First is RSVPs. We will be doing it all online through this website. Once you have your invitation, look inside for directions to let us know you are coming. If you use Instagram now, great! If not, you can download it for your iPhone or Android phone. It is simple. 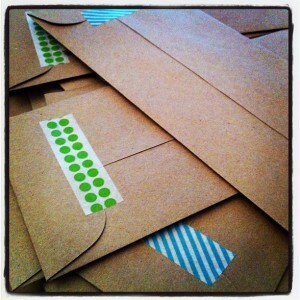 Take a picture of you and your invitation in a creative way! As we get closer to the wedding, we want you to take more pictures. They could be your preparations and journey to the wedding, behind the scenes pictures, and of course, many pictures from the wedding itself. Our Facebook page will become a live-stream of the whole event.